The heat and the longer, brighter days, bring a wide range of insects into the home and garden. There’s also the risk of mosquito bites during the evenings too. So, how can you protect your toddler against these nasty summer insects? The best way to protect your toddler against summer insects is to repel them. Toddler-safe insect repellents will deter biting insects, but keep in mind they won’t protect against stinging insects. According to the American Academy of Pediatrics, insect repellents containing DEET with a concentration no higher than 30%, are safe enough to be used on children as young as two months old. However, if you are planning on using a bug repellent on very young children, it is advised to seek advice from your pediatrician or doctor before using it. You’ll find that DEET bug repellents come in various strengths. While you may be tempted to opt for the highest strength possible, it’s recommended you stick to using a concentration no higher than 10. At this strength, it will protect your toddler for around 2.5-4.5 hours. You can apply the repellent once a day on children up to two years of age. When applying the repellent, spray it onto both exposed areas of the skin and your toddler’s clothing. To apply it to their face, first spray the repellent into your hands, then rub it onto your toddler’s face gently, avoiding the eyes and mouth. It’s worth noting that if you’ve applied sunscreen to your toddler’s skin, you will need to wait up to 20 minutes before applying the bug repellent. Although technically DEET based bug repellents are safe for toddlers, you’ll want to avoid having them wear it longer than needed. So, when they come back indoors, be sure to wash it off the skin. Are Natural Insect Repellents Worth Trying? Understandably, many parents are reluctant to use insect repellents on their toddler’s skin. So, they may consider using a more natural remedy. Natural insect repellents generally include products made from Citronella, Eucalyptus, Soybean and Cedar. Whilst they can prove effective, they don’t tend to provide the same level of protection and they won’t last as long as the chemical repellents. So, if you do decide to use them, you’ll need to keep applying them frequently throughout the day. So, some natural insect repellents can prove effective provided they’re applied frequently. However, they’re definitely not as effective as the chemical repellents on the market. What your toddler wears during the summer will also determine how likely they are to attract bugs. Ideally, you’ll want to make sure they’re wearing long sleeved, loose fitting clothing. The color of the clothes also matters, with brighter colors attracting bugs and insects. So, ensure they wear muted colored clothing while they’re outdoors. Also, instead of sandals, dress your toddler in socks and shoes. Remember, spraying their clothing with a bug repellent will also provide added protection. Bugs and insects come alive in the early mornings and early evenings. Therefore, if you’re looking for the best protection, the key is to stay indoors during these peak times. You’ll also want to make sure the windows in your home are closed, as Mosquitos in particular, can end up flying inside in the early evenings. If you’re planning on heading out to the woods this summer, or anywhere with long grass for that matter, you’ll want to keep a lookout for ticks. They can easily attach themselves to your toddler, and tick bites can be potentially serious. While it’s not always possible to spot ticks before they attach onto your toddler’s clothing, there are things you can do to get rid of them and ensure they don’t cause potentially serious problems. When you get your toddler home, give them a bath within two hours. Wash their clothing too, even if it doesn’t appear to be dirty. Ticks can cling onto the clothing, lying in wait for an opportunity to feed. Once washed, place them in the dryer for around one hour. This will kill off any ticks which were unfortunate to try and catch a lift! Despite how well you think you’ve protected your toddler against summer insects, there’s always a risk they can still get bitten. If this happens, the first thing you should do is apply a cold compress onto the area. This will reduce the itchiness or burning sensation caused by the bite. It will also help to reduce any swelling which may occur. You may also need to distract your toddler, as if the bite itches, they’re going to scratch it. The more they scratch it, the worse it will become. So, if you can’t cover it up, keep your little one distracted as much as possible. Antihistamine medication can also help to ease itchiness, especially if your toddler is allergic to the bites. However, before giving them Antihistamine medication, you’ll want to check that it’s safe to do so with your doctor or pediatrician. If your toddler has been bitten numerous times, or the bite appears to be angrier than it should be, it’s worth seeking advice from a doctor. They will be able to assess the best course of treatment. At the very least, it will provide you with peace of mind. 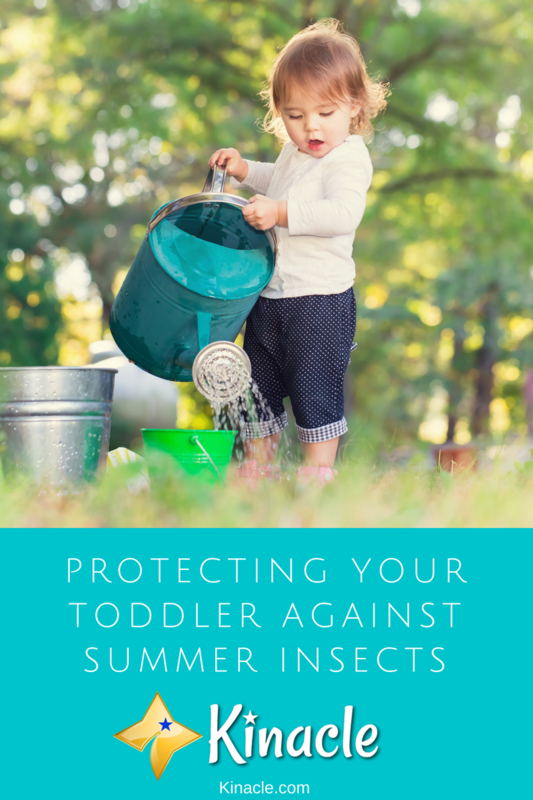 Overall, protecting your toddler against summer insects isn’t always easy. However, the tips above will help to lower their chances of getting bitten. Remember, the tips above will only protect your little one against biting insects. Stinging insects are more difficult to deter, though ensuring your toddler knows not to go near wasps, ants and other stinging insects will greatly reduce their chances of being stung.